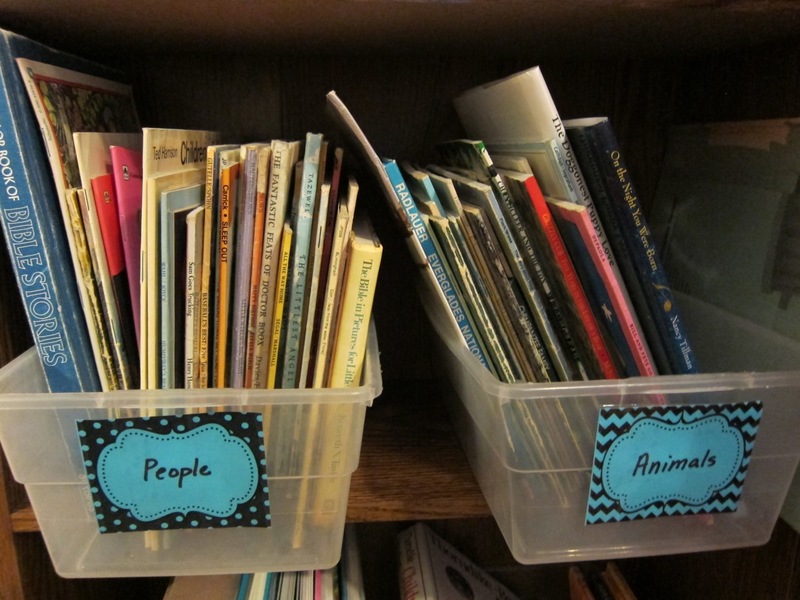 I’m a teacher, and I keep the books in my classroom in labeled baskets. 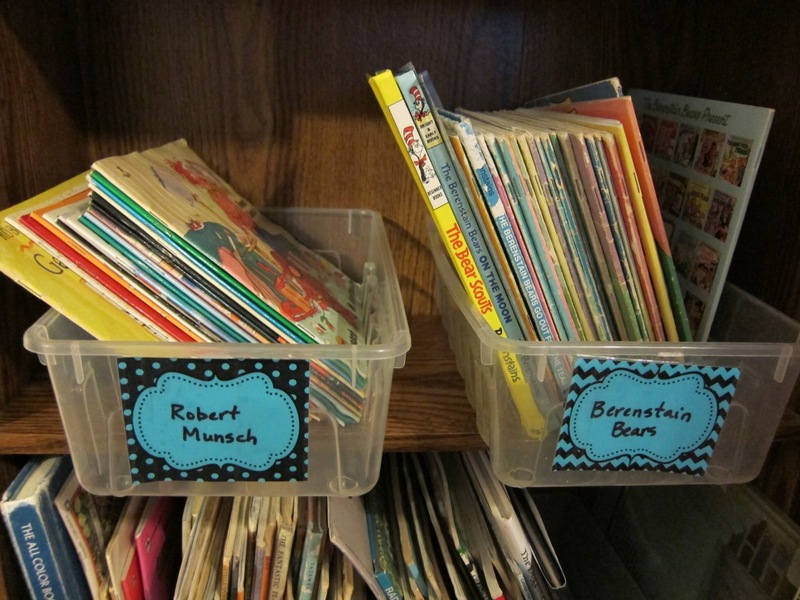 I like having the books organized by categories, such as historical fiction, fantasy, life science, biographies, etc. 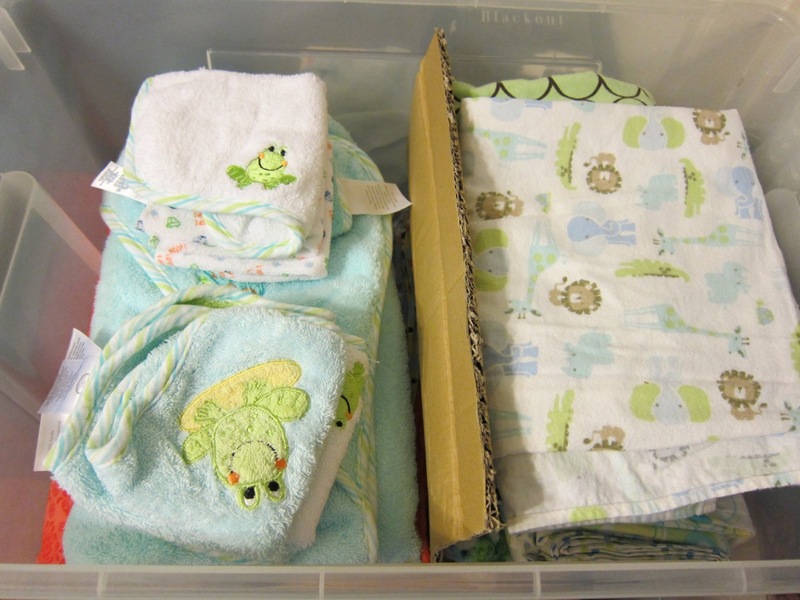 At home, I wanted to do something similar, but in a frugal way. 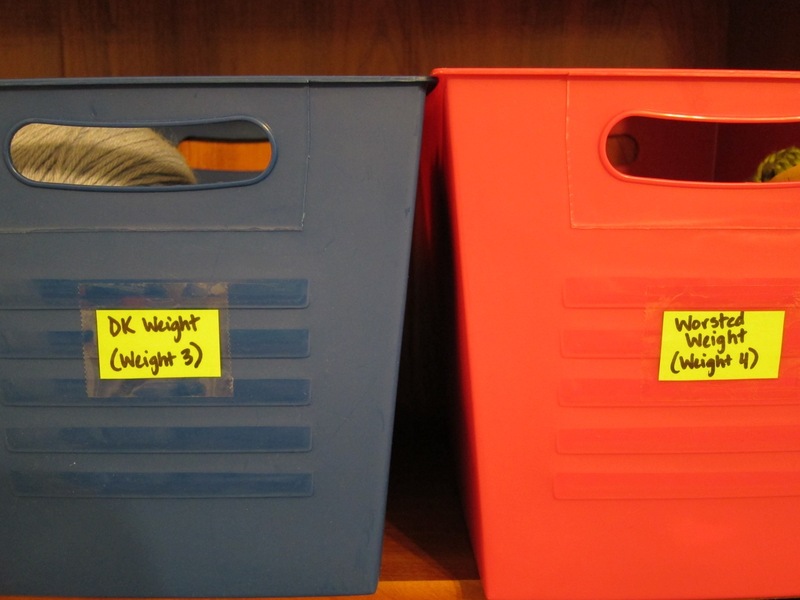 I used some leftover plastic bins and I printed some labels. 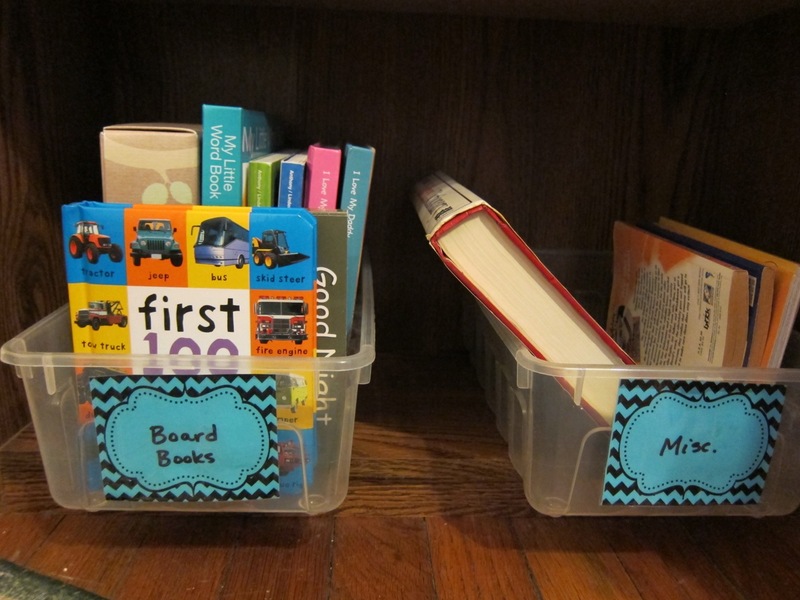 I sorted the books into categories, wrote those categories on labels with a Sharpie marker, and then covered the labels with packing tape to keep them from tearing or wearing out. 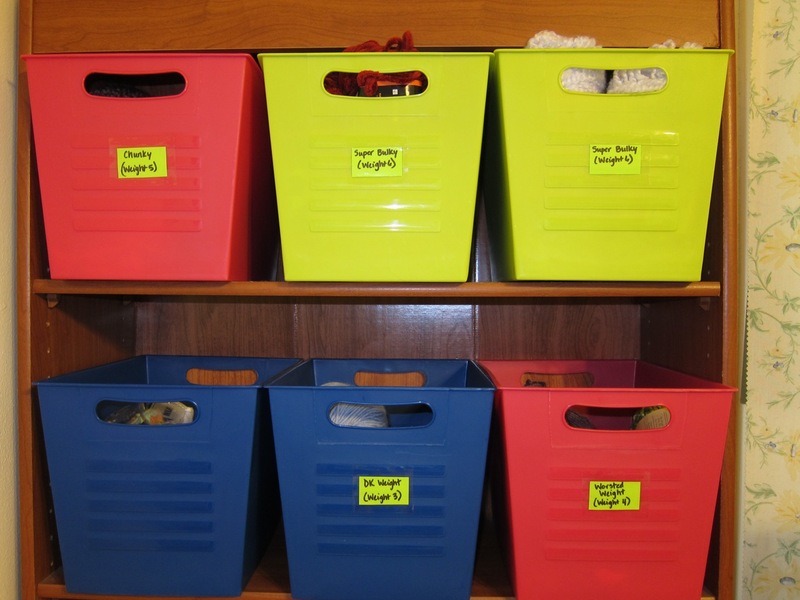 I’ve been keeping my yarn stash in bins on a bookshelf, but the yarn wasn’t organized. 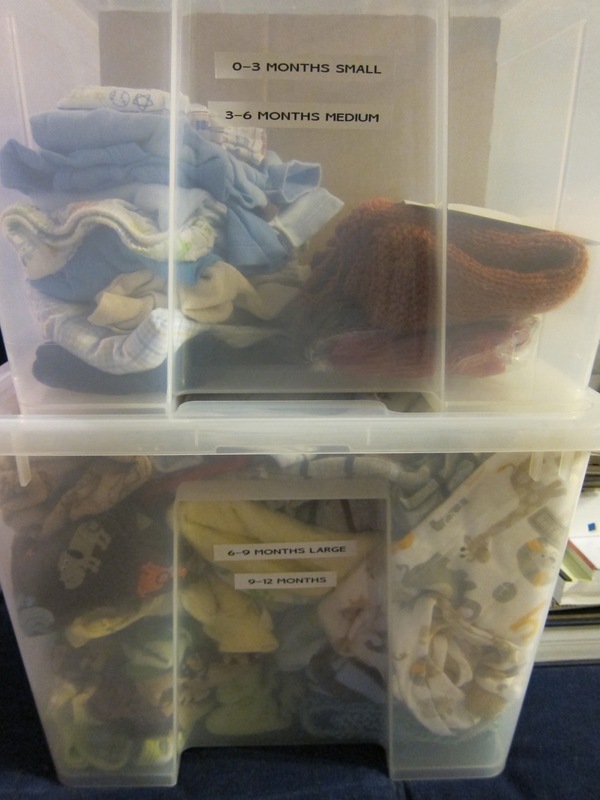 I recently sorted the yarn by weight and labeled the bins. 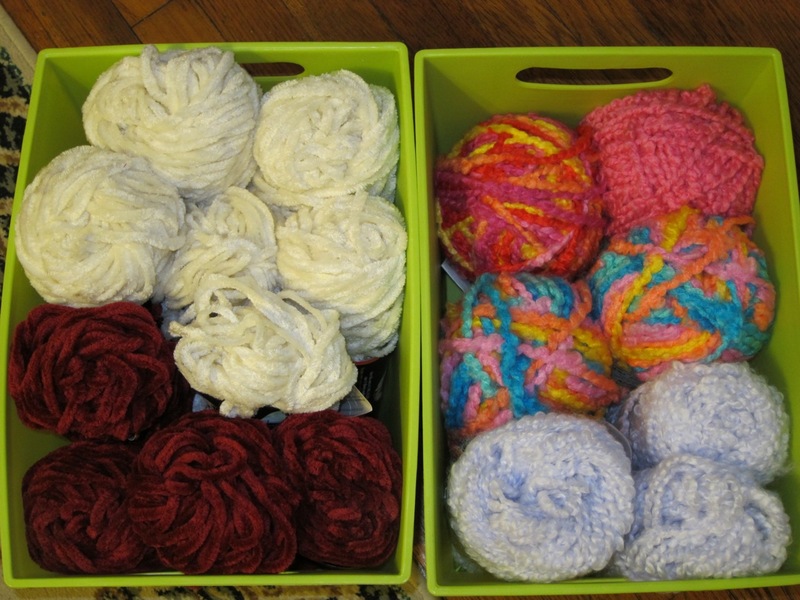 It makes it much easier to choose projects, because I can now look to see if I have a certain weight of yarn. It also got me looking up the yarns I had to determined what their weights were. 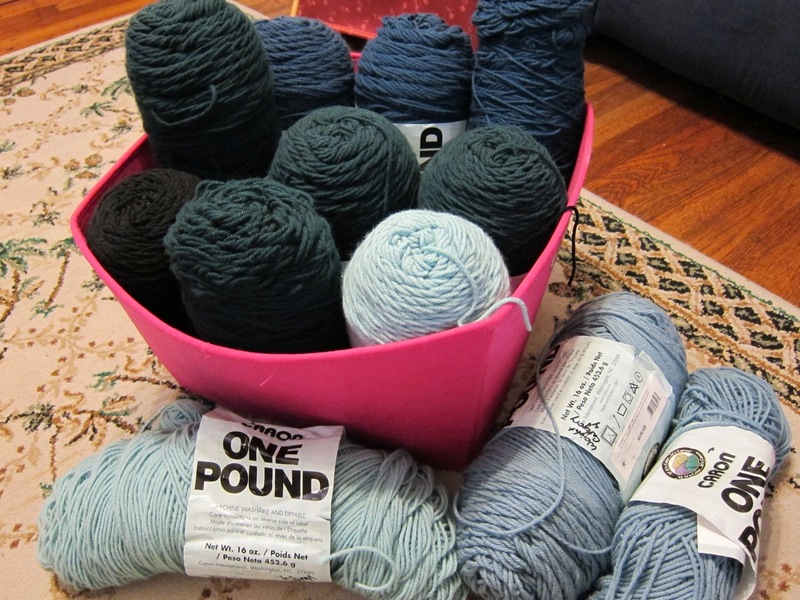 I have a lot of Caron One Pound yarn (Weight 4). 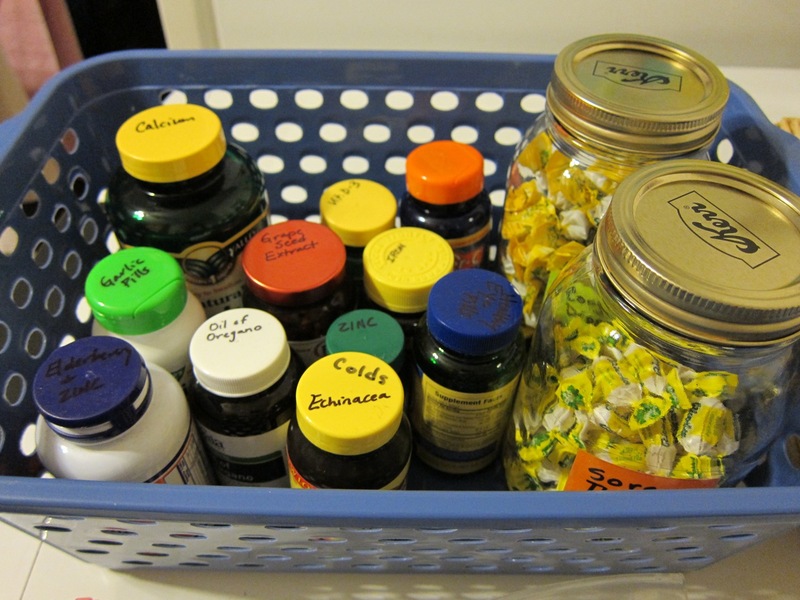 I recently organized my stash of medicines, vitamins, and herbs. I had them in two different rooms in the house, so it was good to get them all together in one place. 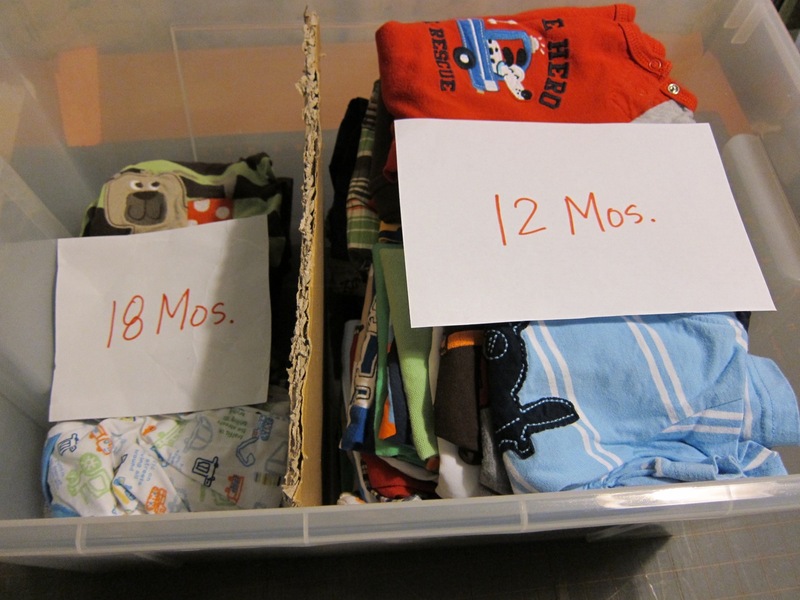 First, I pulled the ones that were expired. I was surprised how old some of them were. 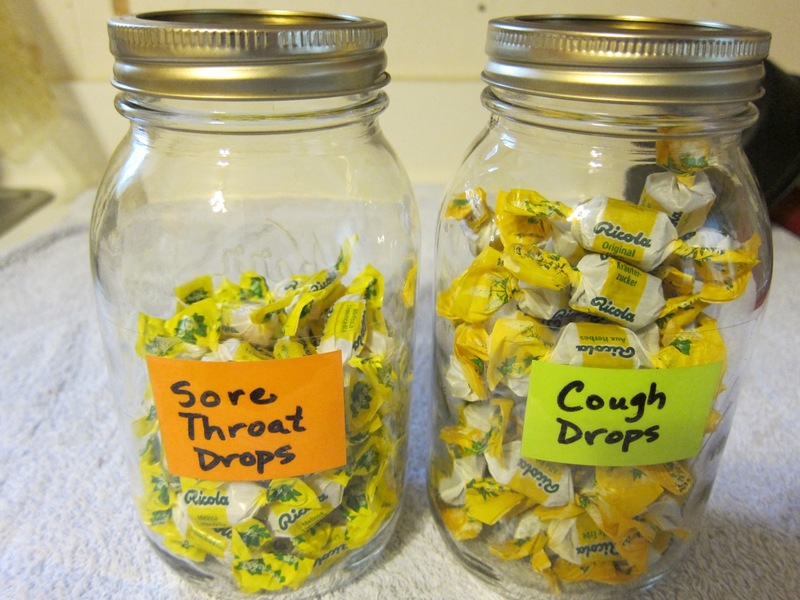 I put cough drops and sore throat drops in labeled jars. 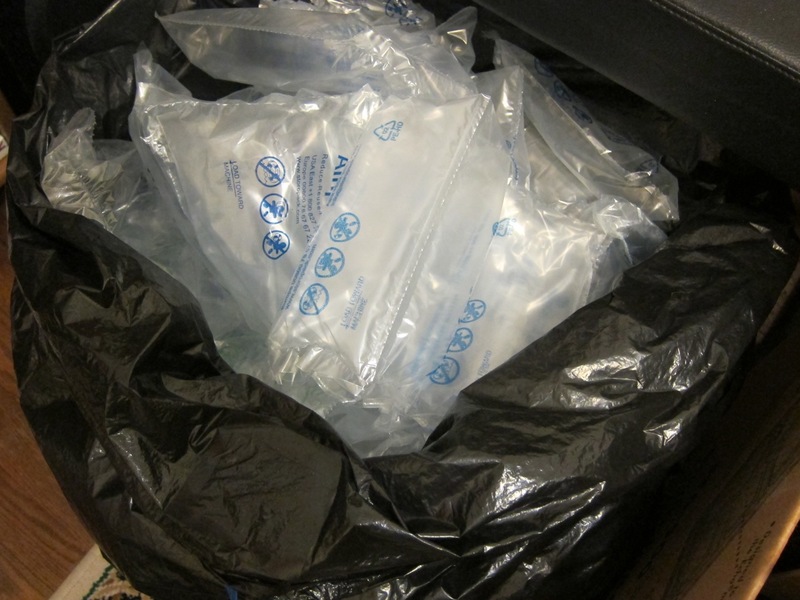 They would be easier to get to in jars than in the bags they came in. 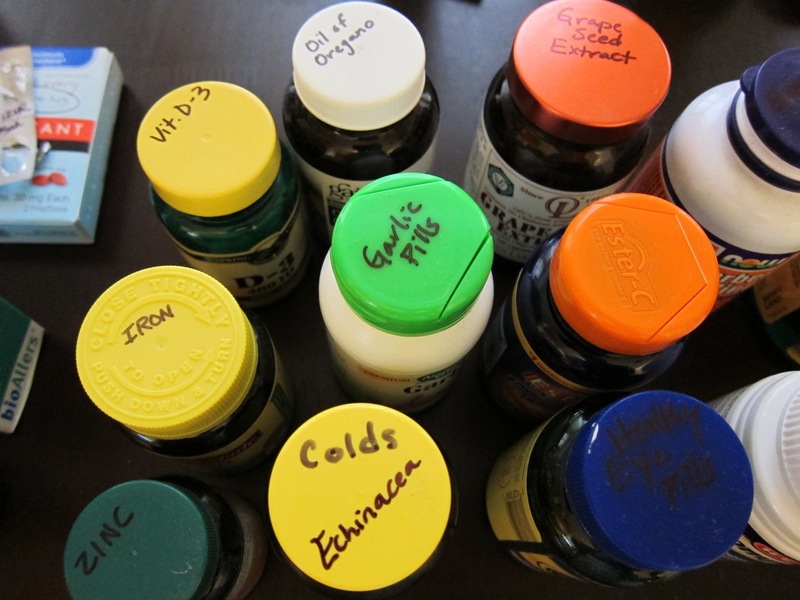 Like I did with my spice jars, I labeled the tops of the bottles and boxes of medicines, vitamins, and herbs. 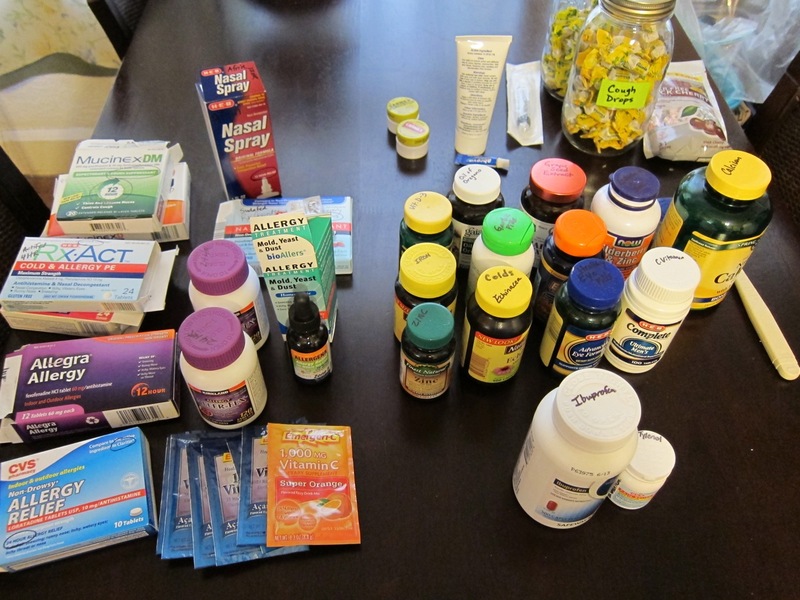 The vitamins, herbs, cough/sore throat drops, and misc. items went in one basket. 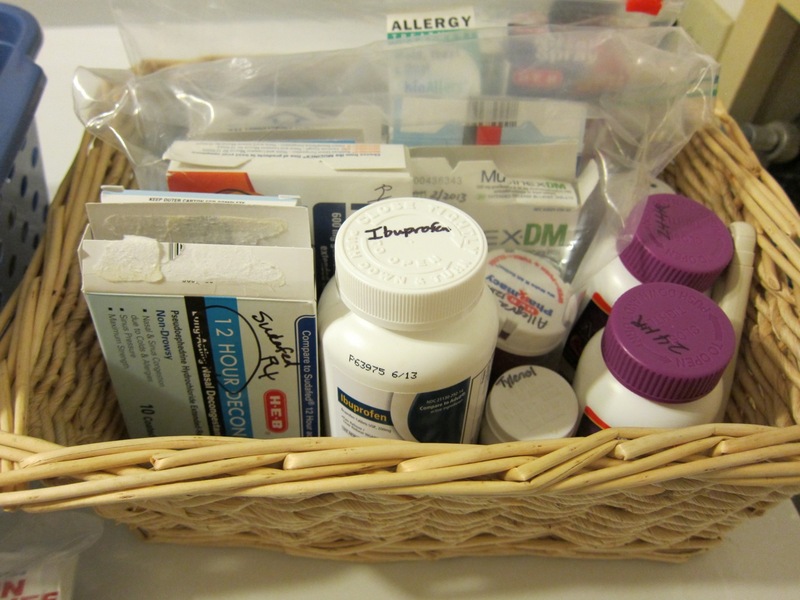 The other basket held items for allergies and colds, including pain relievers and the thermometer. 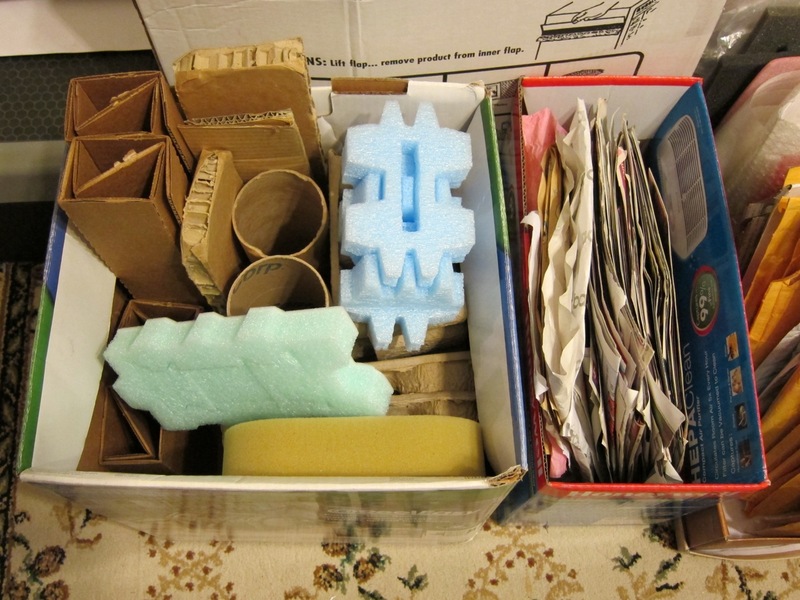 I often clean out my freezer and complete a new freezer inventory. 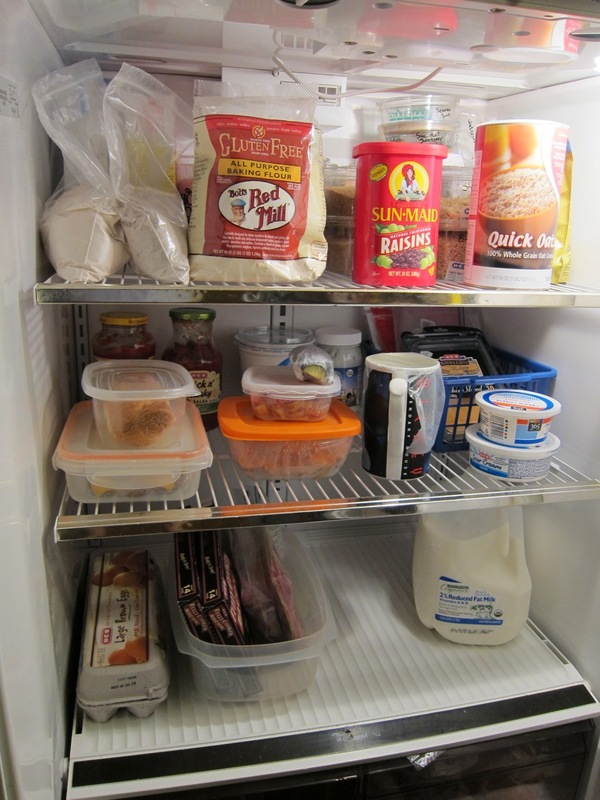 It’s not often that I organize all of the canned goods in my kitchen, or completely clean and organize my fridge. I finally got around to doing this task, after procrastinating for a long, long time. I knew it needed to be done, because I had similar foods in several places in my kitchen. For example, I knew I had canned beans in three places! 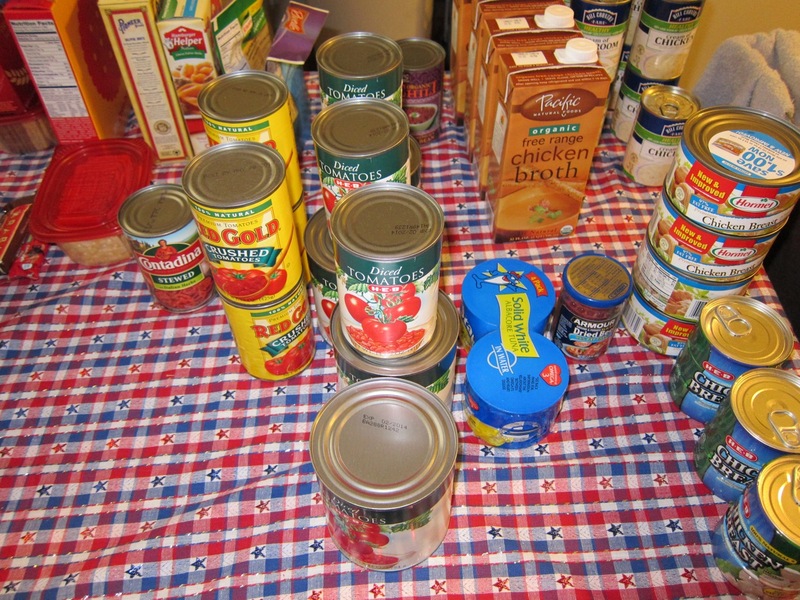 First, I took all the canned goods of the shelves and sorted them by type. I tossed any that were expired. Above, you can see meats, tomatoes, soups, etc.. 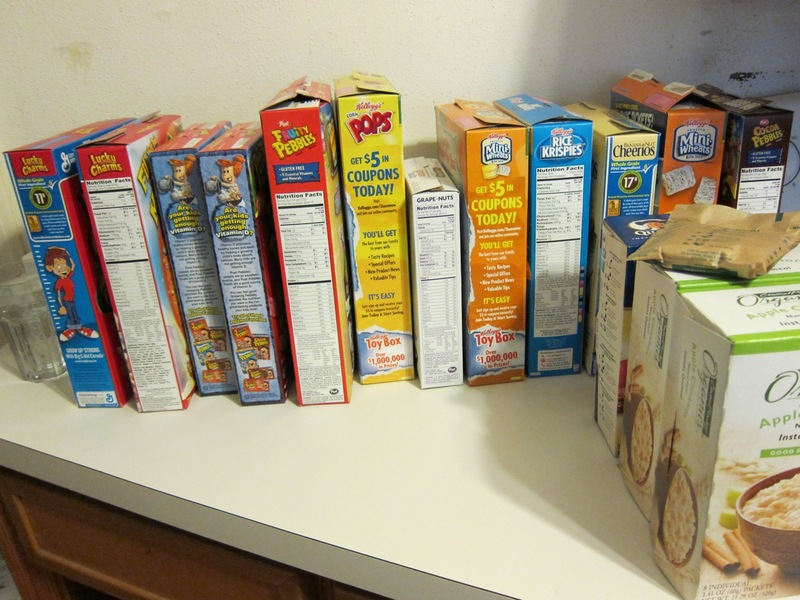 I was very surprised at how much cereal we had. 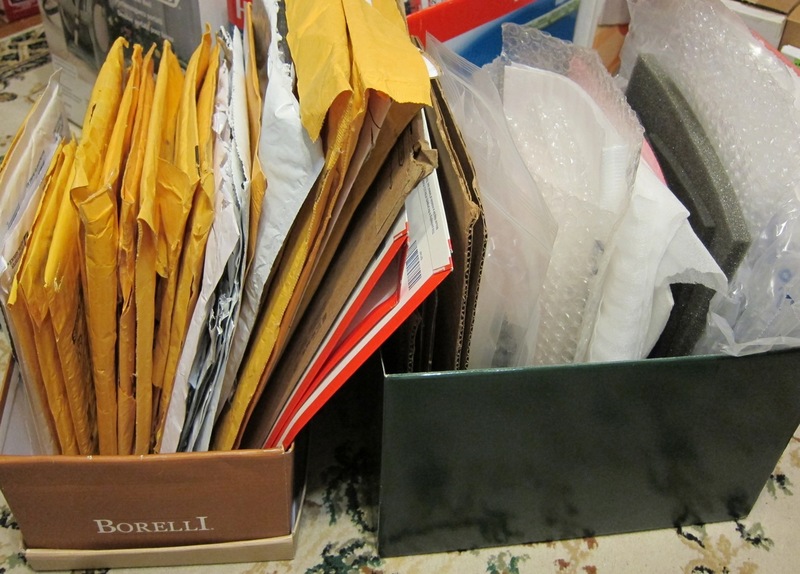 Some of it wasn’t even being stored in the kitchen! 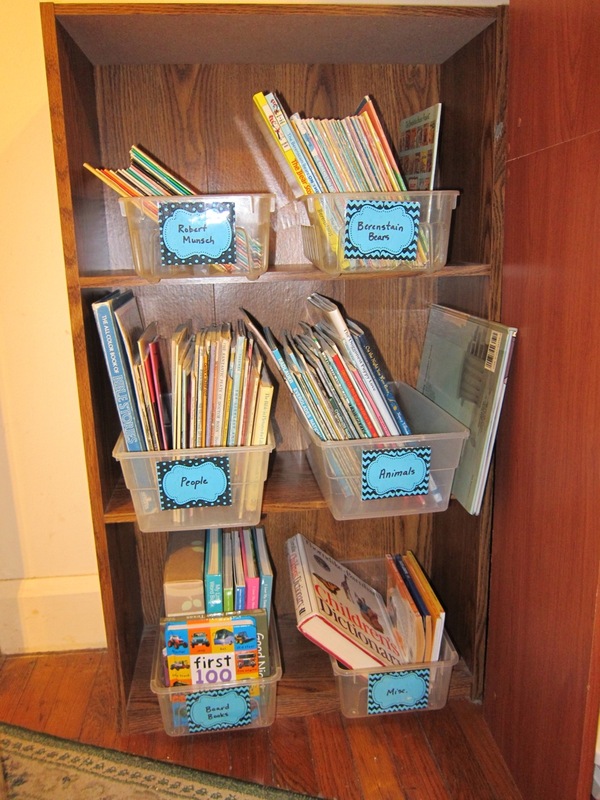 I then put items back on the shelves, keeping similar items together. 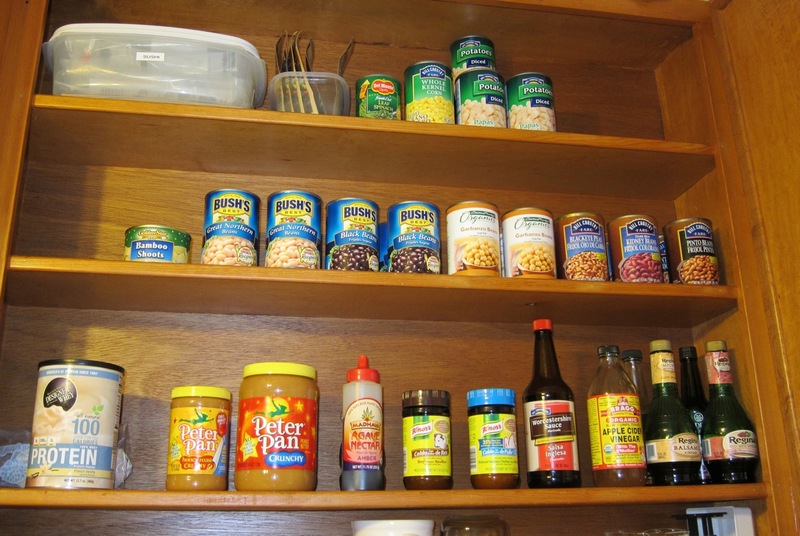 I was able to use a wire stacking shelf to put some smaller cans above jars of pasta sauce. 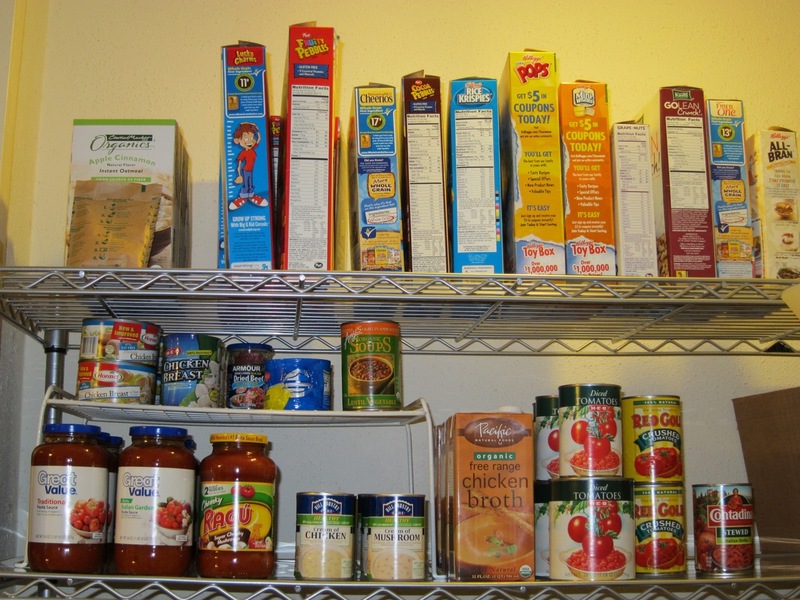 Above, you have pasta sauce, meats, soups, and tomatoes. 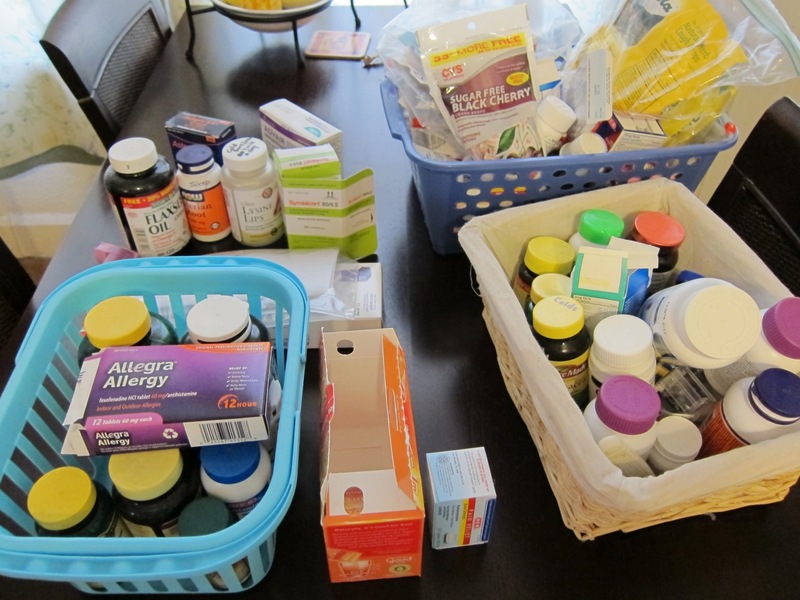 Here, you have beans, veggies, sushi materials, gravy mixes, peanut butter, protein powder, and condiments for cooking. 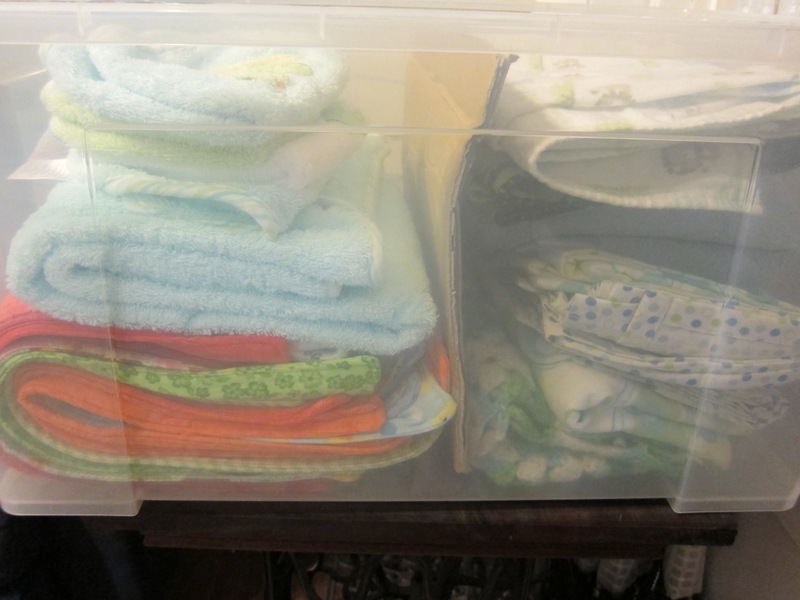 I went ahead and organized my kitchen cupboards as well. 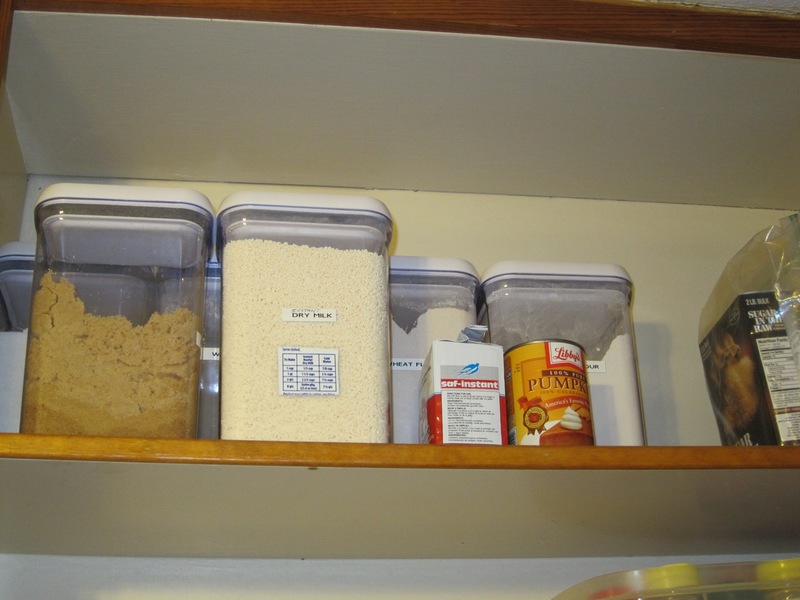 I moved my wheat-filled flours and sugars to the top shelf of a cabinet. 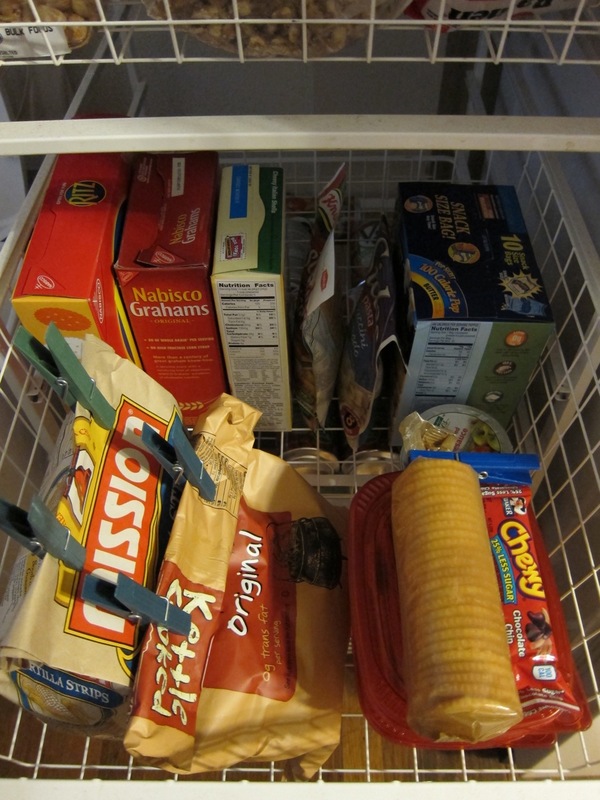 I also decided to stick my baking food storage up there as well (canned pumpkin, salt, etc.). Since I was on a roll, I decided to work on the fridge as well. 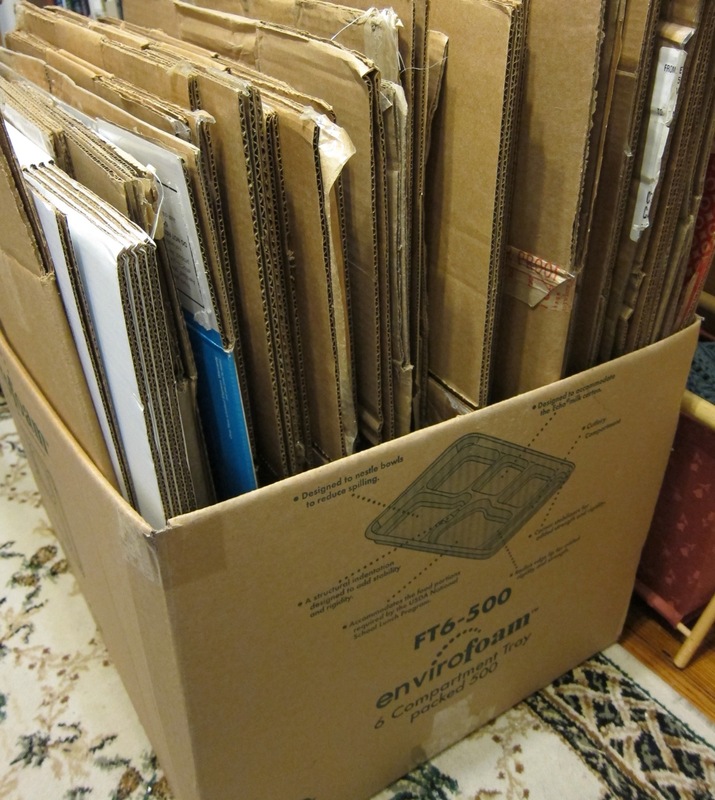 I took everything out, sorted it by type, threw away anything expired, and then gave the empty fridge a very good scrubbing. I put baking items on the top shelf, with non-wheat items toward the front. Cheese, pasta sauce, salsa, yogurt, and leftovers went on the middle shelf. Eggs, meat, and milk went on the bottom shelf. 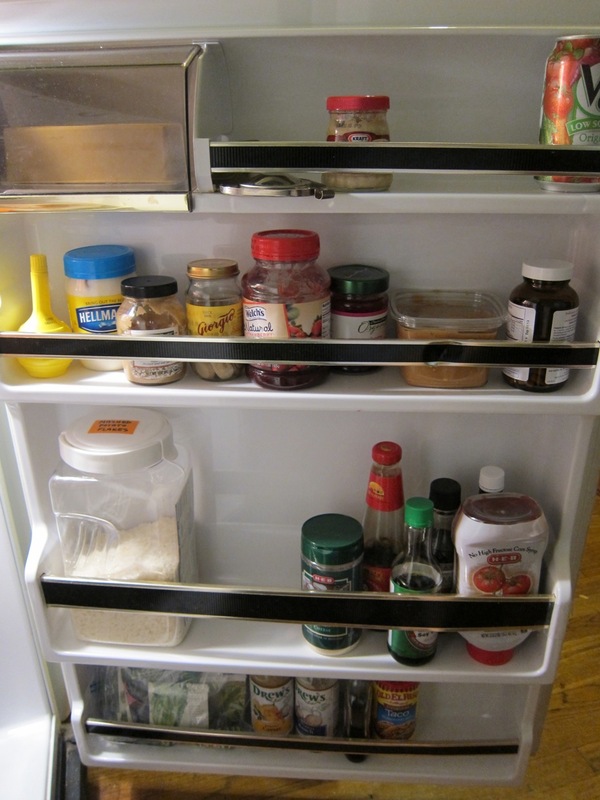 The door shelves have condiments organized by type (and size). 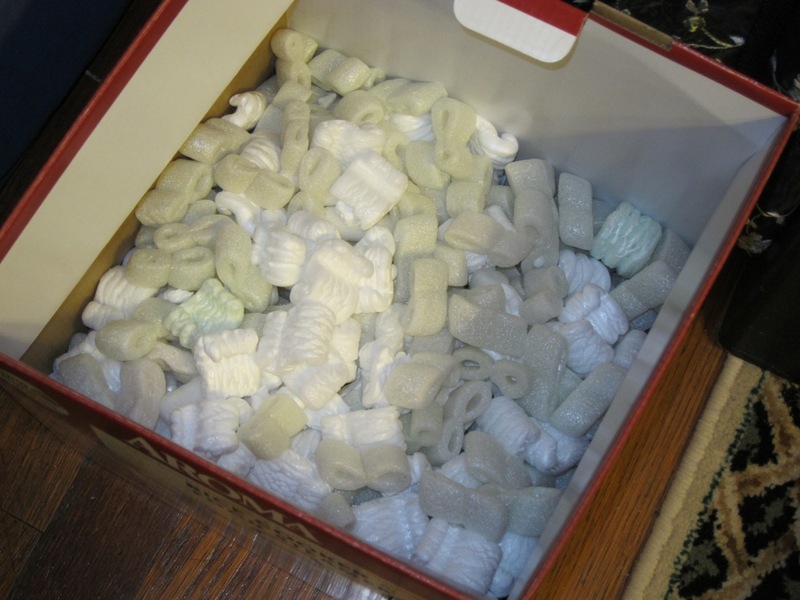 At the bottom left, you can see where I store my garden seeds. 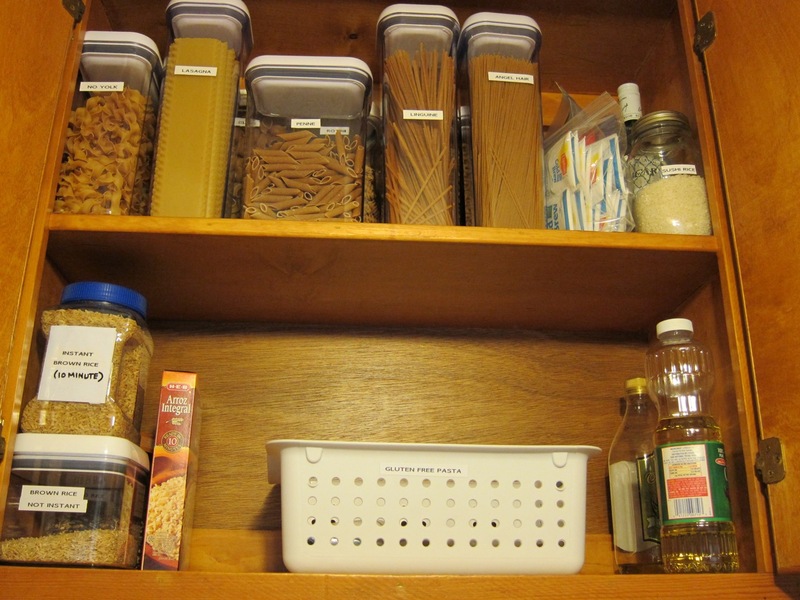 Since I can’t eat wheat pasta, I decided to make room for gluten free pasta in the cabinet where I store my pasta and rice. I put the wheat pasta and white rice on the top shelf (that requires a chair to reach), and I left the brown rice and gluten free pasta on the lower shelf. I probably won’t be putting my GF pasta in storage containers like my wheat pasta, so I have a basket that I can easily pull off the shelf.